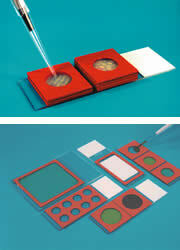 SecureSeal™adhesive chambers form peel-and-stick enclosures to isolate specimens affixed to glass microscope slides. RNase free, gasketed chambers provide optimum-to-volume fluid dynamics for hybridization assays on large or multiple specimens and genomic arrays on glass slides or film coated slides. Design minimize friction, promotes reagent mixing, and facilitates uniform hybridization. Sealable access ports (1.5mm) in the chamber surface allow for the addition and removal of reactants. SecureSeal™adhesive bonds chambers to glass in seconds and removes cleanly and easily even after heating. SecureSeals™are ideally suited for protocols utilizing autoradiographic, fluorescent or cheminescent end points. All Hybridization Chambers have 1.5mm diameter Ports and come with 120 Port Seals. Ports are easily sealed using Adhesive Seal Tabs (provided) to prevent reagent evaporation. Sealed chambers are watertight and ideally suited for water-bath incubations. RNase free, hydrophobic surfaces will not trap or bind probes. Disposable chamber remove cleanly and easily even after heating. These new microarray chambers are designed specially for compatibility with Cy5® or Alexa Fluor 647® direct labeled DNA probes for hybridization assays. These chambers as well as the original HybriWells may also be used with all other fluorochrome labeled probes. Each package includes illustrated instructions for use, applicator and 200 adhesive port seals. (Additional seal tabs are sold separately at EMS # 70328-00). FastWells™ stickable, stackable, sealable, peelable and reusealble reagent barriers! An assortment of flexible, press-to-seal gasket and coverslip enclosures which can be quickly assembled and disassembled for the specialized challenges of hybridizing and imaging thick and free- floating specimens. All steps - from permeabilizing to image analysis are made easy and trouble free with chambers you assembles from modular components. For neural explants, plant or animal specimens of any texture and thickness. Build up to three chambers on one microscope slide. Ideally suited for overnight hybridizations and agitated washing steps. The screen is made from polyester and is 1.6mm square. Silicone isolators allow researchers to isolate specimens using removable hydrophobic barriers. They may be used to isolate cells grown in culture dishes or separate multiple specimens affixed to microscope slides. Isolators are pre-cut into gaskets or as sheet materials with and without SecureSeal™ clean release adhesive on one or both surfaces. Isolators remain sealed to smooth surfaces during washing steps. Non-adhesive isolators are autoclavable and reusable. Closed chambers may be formed using flexible RNase free, HybriSlip™ covers. Silicone (S) / Adhesive (A) – press-to-seal silicone on one side and adhesive on the other side. Adhesive (A) / Adhesive (A) – press-to-seal adhesive on both sides. To fulfill your needs, we also offer the Sheet Material that can be used to match your own design chambers. Hybrislips™ - ideally suited for in situ hybridization, in situ PCR and hybridization to genomic arrays on glass slides. HybriSlips™ are flexible, thin (0.25mm) covers that minimize fluid friction and facilitate uniform reagent distribution. RNase free, hydrophobic covers will not trap or bind probes to their surfaces like coverglass. Product is ready-to-use without pretreatment. Working surfaces are protected with clean release liners to prevent RNase contamination. Hybrislips™ remain flat and will not curl, even at high temperatures.